The Disney princesses and the Monster High join in this fun game in which they are going to carry out a likes war on Instagram. Both groups believe that they are more successful than the opposite and we will discover it with this competition. We will have to start preparing the Monster High, choosing a nice wardrobe, the hairstyle and the face with which they will pose for the photo. Once ready, we will do the same with the Disney princesses, being able to make as many combinations as you want. Once the two groups are ready and the photos are done, we will go to Instagram and the likes will begin to add up. The group with the most support from social networks will be the winner. 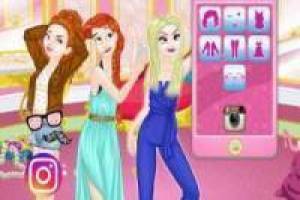 Enjoy the game Disney Princesses VS Monster High: Instagram, it's free, it's one of our Monster high games we've selected.